Add a timeless element to any dressy outfit with the Rice Pearl Necklace. A single strand of freshwater pearls seems to loop effortlessly around your neck with its medium length. The multicolored pearls chosen for this necklace are elongated and lightly blemished with a beautiful high luster. Each pearl is less than 1 centimeter wide and is individually knotted on the strand with fine cord. With a 925 sterling silver lobster-claw clasp, the necklace can be worn comfortably and securely. Expect good uniformity in shape and coloring from pearl to pearl and a flexible feel to the strand. 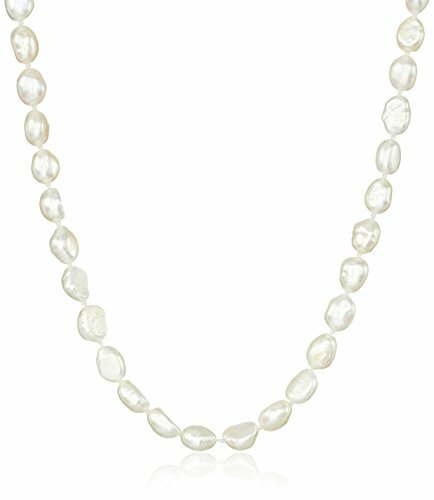 This pearl necklace will easily complement many necklines and styles, so you can create your own customized look.